Hindsight is 20/20 — and four Wharton Wall Street veterans had plenty of it to share when they joined Dean Geoffrey Garrett for a panel discussion looking back at the global financial crisis 10 years later. Marking the anniversary of the Lehman Brothers bankruptcy that triggered the Great Recession, the Tarnopol Dean’s Lecture Series asked the question: What did we learn from the 2008 crash and what’s next for financial services and technology? 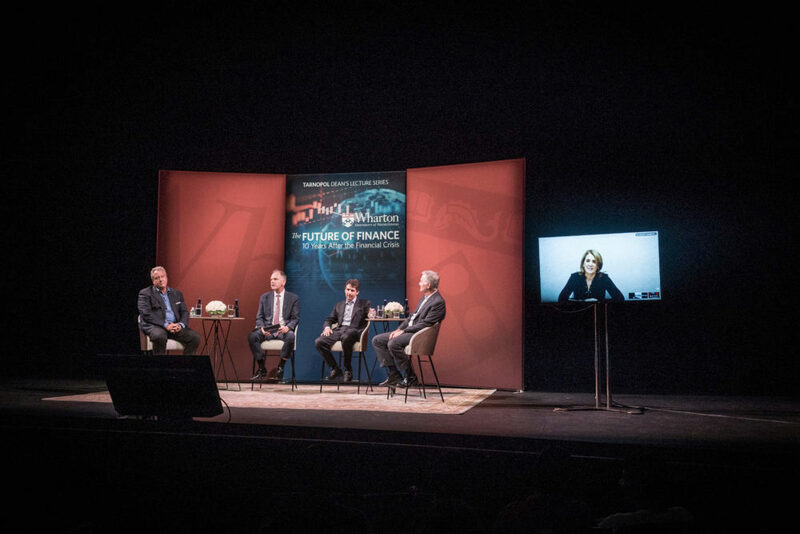 James G. Dinan, W’81, Marc Rowan, W’84, WG’85, and Robert Wolf, W’84, joined the Dean on stage at the Annenberg Center for Performing Arts, while Ruth Porat, WG’87, made a virtual appearance live from Google’s California headquarters where she serves as CFO for Google and its parent company Alphabet. (From left) Robert Wolf, W’84, Dean Geoff Garrett, Marc Rowan, W’84, WG’85, and James G. Dinan, W’81, on stage at the Annenberg Center for Performing Arts, joined by Ruth Porat, WG’87, live from Google’s California headquarters for the Tarnopol Dean’s Lecture Series. Widely considered one of the most powerful women in finance and technology, Porat drew from her experience in both industries for the panel discussion. The former Morgan Stanley CFO answered the U.S. Treasury Department’s call for help when the global financial services industry began careening in 2008. Working closely with then Treasury Secretary Henry Paulson, she led the Morgan Stanley team advising the United States Department of the Treasury regarding Fannie Mae and Freddie Mac, and the New York Federal Reserve Bank with respect to AIG. In her opening remarks, she shared her biggest takeaways from that time. The first and most important (lesson) is that every company, every industry, needs to identify its source of vulnerability and protect against it in the good days. During the crisis, the biggest issue for all of us was liquidity. The metaphor I think of is that you would not drive a car with mud on the windshield. You similarly should not run a business with mud on the windshield. You need to have visibility and transparency. To me, the most frightening moment in the financial crisis was actually AIG. Their issue was their derivative sum in the UK. And there was not nearly the level of awareness about the risk and the exposure that was going on in this other part of AIG’s world. Without the systems and controls, risk analytics, and tools, it’s like you are driving a car with mud on the windshield. You need to invest in that early. I thought of that again during the crisis in Greece. If people had intervened early, we may have prevented much of the spread to the periphery. The problem is, by the time you get the political will, you may not have the financial capacity to address it. Again, that’s true for each of us who runs businesses, it’s easy to be sort of lax in the way you use resources in good markets and then you regret that later when you could have actually focused them to build a stronger position. What was really extraordinary in those days is that we had to move really quickly — the phrase back then was you were picking between “least worst options.” There were no good options. You really had to have instinct based on experience. What Hank did is really bring together a team that was able to have that instinct based on experience. And that’s guided me as I think about how to build my team. I want people to have what I call “battle scars”. It’s my first interview question. I want people who have pattern recognition because they’ve been through these types of good days and bad days before. So that they’re thinking three, four, kind of five plays down the field. 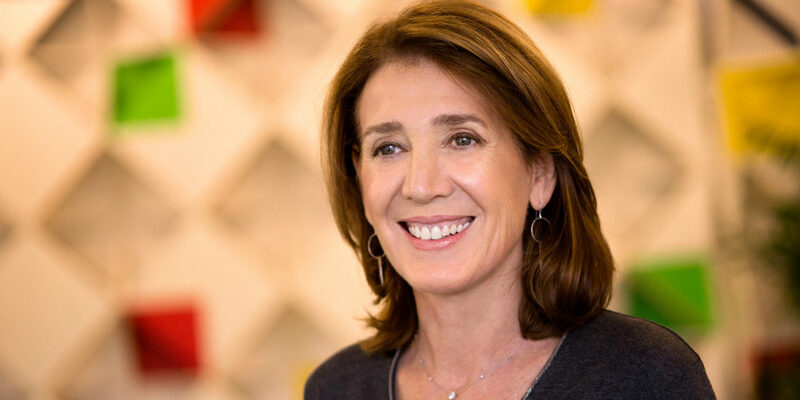 In addition to her insights about the global financial crisis, Porat also shared a personal takeaway from her banking days: “As markets evolve, new industries are created and it continues to create new opportunities for you,” she said. What did we learn from the 2008 crash and what’s next for financial services and technology? Remembering ‘Lehman Weekend’: Where Are the Risks Now?